The effect of exposure of 7050 aluminum alloy to high temperatures has been studied using ultrasonic techniques. Contact, immersion, and laser ultrasonic techniques were used. The relationships of parameters of ultrasonic propagation with static material properties and material microstructure were evaluated. Pattern recognition techniques were used in conjunction with immersion ultrasonic measurements to distiguish between different heat treatments. It was shown that attenuation measurements at high frequencies (> 20 MHz) can provide an indication of material microstructure and thus mechanical properties of 7050 aluminum. 7050-T7451 aluminum alloy (AA7050-T7451) has applications in aircraft structures that can be subjected to abnormally high temperatures as a result of accidental hot exhaust leaks or engine fires. The conventional method of assessing the mechanical properties of heat-damaged parts requires both hardness and electrical conductivity measurements [1,2,3] and can not be used on in-service parts because of indentations created by hardness testing procedures. The state of in-service parts is currently determined by assuming that the alloy is in the fully-annealed condition, and replacement is indicated if the conductivity value falls outside the manufacturer-specified range for AA7050-T7451. The cost of repair and replacement under this criterion is extremely high. A non-destructive inspection technique is necessary to properly assess the extent of the heat-damage, thus providing a scientific basis for repair or replacement of the affected zones. Figure 1. Precipitate phase transformations due to heat treatment are shown with the relationship between hardness and conductivity for AA7050. Figure 2. Time-temperature transformation diagram for AA 7050 (from Reference ). AA7050 is an aluminum- zinc-copper-magnesium alloy used in many aerospace applications including various fuselage structures, wing coverings, landing gear supports, and rivets. As with most other aluminum alloys, heat treatments are used to increase the hardness and strength of the 7050 alloy. These treatments generally consist of high temperature homogenization, followed by single or multi-step low temperature treatments to induce various precipitations and attain a particular stable state (temper). This sequence can be followed with the help of Figure 1, which shows the relationship between hardness and conductivity for AA7050, as determined under controlled conditions using test coupons simulating various degrees of thermal exposure1. Open circles are data from the samples A-H used in this experiment. Solid circles are data from reference . Hardness was measured in the Rockwell B scale (HRB), and the electrical conductivity was measured using the International Annealed Copper Standard (%IACS) units. Figure 2 shows the time and temperature dependence of precipitate formation (time-temperature transformation (TTT) diagrams) as modeled by X.J. Wu et al. for the 7050 aluminum alloy. Together, the hardness-conductivity relationship and the TTT diagrams form the basis for understanding the temperature-driven behavior and properties of the 7050 alloy. Guinier-Preston (G-P) Zones, which have high concentrations of magnesium and zinc, are coherent with the FCC structure of the matrix, thus contributing to a rise in hardness and strength and a reduction in conductivity compared to the solid solution state. The standard artificial aging treatment to obtain high G-P Zone content is the T6 temper, which consists of a 24 hour treatment at 120°C (Figures 1 and 2). From the T6 temper to the T7451 temper, the formation of semi-coherent metastable ' phase results in an increase in electrical conductivity, and a slight decrease in hardness and strength . From the T7451 temper, any subsequent exposure to temperatures significantly higher than the normal aging temperatures (160°C for this particular temper) progressively leads to a loss of hardness and strength as the strengthening precipitates first over-age and then go into solution. Heat treatments applied to AA7050 samples. 27230	 F	 272°C / 30min. 30045	 G	 300°C / 45min. 30060	 H	 300°C / 60min. Eight samples each measuring 200mm x 102mm x 6.35mm were machined out of two sections of cold-rolled AA7050-T7451 plate. This thickness was chosen since it was within the thickness range of airframe sections where heat-damage occurs. Each sample was then heated in a furnace at a given temperature for a specific duration to simulate different degrees of heat damage or achieve a particular temper (Table 1). Since the as-received material was already at a T7451 temper, three of the samples were solution treated prior to their specific heat treatments. This was done to achieve the T6 temper as well as two treatments between the T6 and T7451 tempers. The samples were water quenched rapidly after each heat-treatment stage. Hardness measurements were made using a Clark Hardness Tester, and electrical conductivity measurements were performed by means of a Magnaflux FM-140 conductivity meter. The measured values were considered to be accurate to within ±0.5 %IACS. 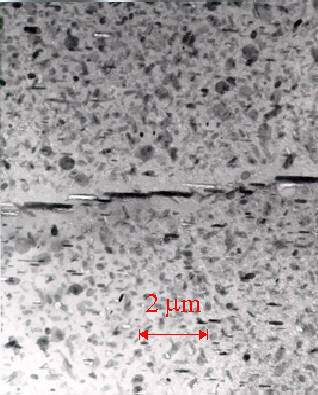 The mechanical properties of AA7050 are controlled by the microstructure. Since these factors also influence ultrasonic wave propagation, ultrasonic characterization of material properties should be possible. In particular, attenuation is influenced by scattering from inhomogeneities such as grain boundaries and precipitates, as well as diffraction and absorption. Ultrasonic attenuation measurements can be sensitive to microstructural changes when sufficiently precise techniques are used [4,5]. Conventional immersion ultrasonic measurements showed that the ultrasonic attenuation at 10 MHz was weak and did not differ significantly between samples. Pattern recognition techniques were then used to attempt to distinguish between different extremes of heat treatments. Because ultrasonic attenuation generally increases with frequency, the samples were examined using high-frequency laser-ultrasonics. Immersion ultrasonic measurements were conducted at a 10 MHz excitation frequency, using a pulse-echo technique. The facility at IAR is an automated immersion system which uses Tektrend International's ARIUS® software for control and data acquisition. Further data analysis can be performed using Tektrend's ICEPAK® software or IAR's NDI Analysis software. At 10 MHz, changes in attenuation and velocity due to heat treatments were not significant. Therefore, pattern recognition analysis was performed on the data as described in the following. Pattern recognition (PR) algorithms can be used to classify unknown data into classes defined using known data. In this application, three classes were defined corresponding to different heat treatments, these were T6, T7451, and a highly damaged state labelled as HEAT DAMAGED. Training data is used by PR algorithms to create estimates of the probability that a measurement xi belongs to a certain class s (P(xi|s)). Different algorithms generate different estimates of P(xi|s), and use different methods of combining the measurements xi to classify the input vector X, the vector sum of the individual measurements. Obviously the training data must sufficiently represent the P(xi|s). Classification accuracy will suffer if the training data and its variance are not representative of the test situation. A classifier based on a multilayer perceptron type artificial neural network was used to distinguish between samples which corresponded to the T6 temper (sample A ), the T7451 temper (samples D, E), and a HEAT DAMAGED state (sample H). Fifty signals from each class were used to train the classifier, and a different set of fifty signals from each class were then used to test the classifier. Ultrasonic attenuation as a function of frequency was measured on each sample using a laser ultrasonic system at IMI/NRC[7,8] (see Figure 3). For this work, a frequency range of 20 MHz to 60 MHz was employed. Above 50 MHz, the Fresnel parameter, s, was less than 0.15 so that the measurements were made in the near acoustic field and no diffraction correction was required. Measurement repeatability varies with frequency and is better than (0.01 Np/mm at 50 MHz. Figure 3. A simplified block diagram of the laser ultrasonic system used in these experiments. After completion of ultrasonic measurements, specimens were machined from the samples for tensile testing according to ASTM standard B557M-84. Four tensile test specimens were made from each sample. An MTS 880 load frame was used to load the specimens in tension to failure. Strains were measured using MTS 632.11B-20 extensometers, and loads recorded using the MTS data acquisition software. Figure 4. TEM micrographs for heat-damaged AA7050, from top left with precipitates changing from coherent GP zones to incoherent ' and phases. Figure 5. Optical microscope pictures of grains in different samples: on the left, sample G, a heat damaged sample. On the right, sample E, at temper 7451. Black bars in centre of images are 200 mm long. Transmission Electron Microscopy (TEM) was used to observe differences in microstructure (precipitates) of heat-treated/heat-damaged samples. TEM samples consisted of 3 mm diameter discs, electropolished in an automated twin jet polisher (Tenupol-3) in a 3/1 methanol/nitric acid solution cooled at -45 °C. 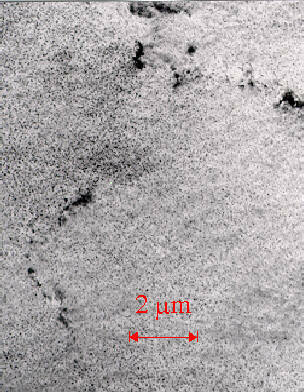 Figure 4 shows TEM micrographs viewed at 80,000x magnification for different heat-damaged specimens. 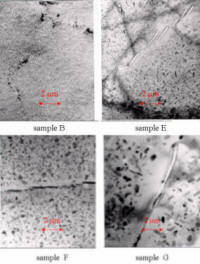 In Figure 4, the evolution of the microstructural changes of 7050 aluminum during heat-damage can be followed. The presence of G-P Zones can be inferred in Figure 4 sample B as very small dark clusters throughout the matrix. That is followed by the formation and growth of h', seen as elongated darker spots in the matrix as well as dark precipitates in the grain boundaries (samples E and F in Figure 4). Finally, the h precipitates form and are shown in sample G of Figure 4 as polygonal shapes in the matrix as well as in grain boundaries. The TTT diagram of AA7050 (Figure 2) identifies the microstructural state of the samples shown in Figure 4. The grain sizes were examined under an optical microscope using polished and etched samples. 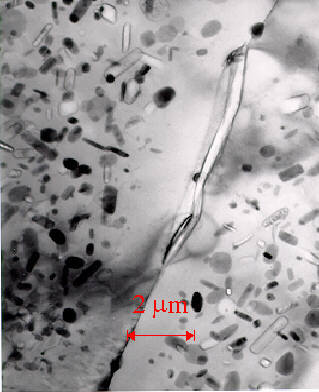 Figure 5 shows an example of grains from a T7451 sample (E) and a heat-damaged sample (G). The grain sizes did not change significantly throughout the heat treatment process. This is important because it implies that the changes in attenuation are likely due to changes in the precipitates. A classifier based on a multilayer perceptron type artificial neural network was used to distinguish between samples which corresponded to the T6 temper (sample A ), the T7451 temper (samples D, E), and a HEAT DAMAGED state (sample H). Results are shown in Table 2 below. Classifier results using 10 MHz immersion ultrasonics. These results show that even at a relatively low frequency of 10 MHz, ultrasonic measurements can be used to distinguish between the T6, T7451, and heat damaged samples with over 90% accuracy. Figure 6 shows the variation of attenuation with frequency for various samples as measured using the laser ultrasonic system described in section 3.2.2. It can be seen that attenuation is lower in high hardness samples, particularly those containing mostly G-P Zones (sample C), and is higher in lower hardness samples containing ' and precipitates (sample G). The increase in ' and precipitate size or volume fraction differences seems to be responsible for the reduction in hardness and increase in attenuation. It is well known that ultrasonic attenuation varies linearly and inversely with hardness . Figure 6. The relationship of attenuation to frequency for the different AA7050 samples. Figure 7. The relationship of yield strength to hardness for AA7050. Figure 8. The relationship between ultrasonic attenuation at 60 MHz to yield strength in AA7050. Sample H (57 HRB) underwent natural aging and hardening at room temperature following the over-temperature exposure. Microstructural changes in this specimen are due to partial dissolution of the ( precipitates during the late stages of the heat-damage. At room temperature, the dissolved elements precipitated in the form of G-P Zones among the remaining larger precipitates. This process therefore results in a very inhomogeneous microstructure that could be responsible for the lower attenuation in this sample. Figure 7 shows the relationship between yield strength and hardness for the samples tested. The hardness of this material is closely correlated with its strength. Ultrasonic attenuation decreased with increasing strength, as shown in Figure 8. 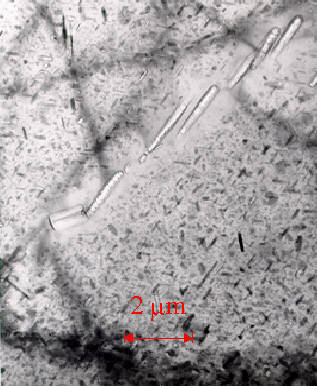 The TEM micrographs of Figure 4 show that the microstructure of the high strength material, Figure 4 sample B, is characterized by very small precipitates coherent with the aluminum matrix. As the alloy progresses through further heat treatments or heat damage, in Figure 4 samples E, F, and G; the microstructure changes to larger and non-coherent precipitates, which are more effective scatterers of ultrasound resulting in higher attenuation. Immersion ultrasonic measurements at 10 MHz, along with signal processing and pattern recognition techniques, were only capable of distinguishing between extreme differences in precipitate phase in 7050 aluminum. Ultrasonic attenuation measurements using laser generation and detection at high (>20 MHz) frequencies are sensitive to precipitate phase changes in the AA7050 alloy, and therefore can provide some indication of material degradation due to high temperature exposure. Overall, ultrasonic measurements provide valuable information that can compliment electrical conductivity tests in characterizing heat-affected zones of aluminum aircraft structures. This work was carried out at the NRC Structures, Materials and Propulsion Laboratory in collaboration with the Université de Moncton and the NRC Industrial Materials Institute. Special thanks to Dr. X.J. Wu and L. Zhao for their assistance in the microstructural tests and interpretations. Funding for this work was provided by the Department of National Defence, NRC, and Université de Moncton. X. J. Wu, A.K. Koul and L. Zhao, "A New Approach to Heat Damage Evaluation for 7xxx Aluminum Alloy", Canadian Aeronautics and Space Journal, Vol. 42, No.2, pp. 93-101, June 1996. 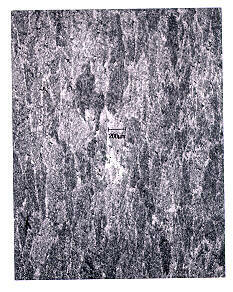 R.A. Chihoski, "Conductivity-Hardness Reveal Heat Treat History Of Aluminum Alloy-Part 1", Metal Progress, pp. 27-32, May 1983. D.J. 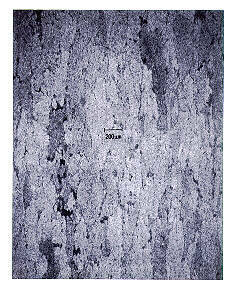 Hagemaier, "Evaluation of Heat-Damage to Aluminum Aircraft Structures", Materials Evaluation, Vol. 40, No.9, pp. 962-969, August 1982. E.P. Papadakis, "The Measurement of Ultrasonic Attenuation", Physical Acoustics, vol. XIX, pp. 107- 155, 1990. M. Rosen, E. Horowitz, S. Fick, R.C. Reno and R Mehrabian, "An Investigation of the Precipitation-hardening Process in Aluminum Alloy 2219 by Means of Sound Wave Velocity and Ultrasonic Attenuation", Materials Science and Engineering, vol. 53, pp. 163-177, 1982. R. LeBlanc, "Évaluation de la dégradation thermique des alliages d'aluminium par les techniques ultrasonores", M. App. Sc. Thesis, École de Génie, Université de Moncton, To be published in 1998. J.-D. Aussel and J.-P. Monchalin, "Measurement of Ultrasound Attenuation by Laser-Ultrasonics", NRC IMI Report, no. 0028913, 1988. A. Moreau and M. Lord, "High-Frequency Laser-Ultrasonics", To be published in Nondestructive Characterization of Materials VIII, 1997. M. Rosen, "Analytical Ultrasonics for Characterization of Metallurgical Microstructure and Transformations", Material Analysis by Ultrasonics, A. Vary, Ed., Park Ridge, NJ, Noyes Data Corp., pp. 79-98, 1987. For more information see backup issue: NDTnet 11/97: NDT in Aerospace .